Originally posted as 25 Years Ago This Week in 2014. Updated in 2019. There have been some dud weeks on the ARIA chart, but the top 50 singles from this week in 1989 is about as boring as it gets. Only three new entries - one from an artist who was really making a nuisance of herself as far as I was concerned and one from another regular chart visitor with his second live track in as many releases (and regular readers know how I feel about live records). The 12" single cover for New Order's "Fine Time"
Thank goodness for the third debut, a brand new single from one of my favourite groups. It was also a song that had (30cm) tacked on the end of the chart entry. For the conversion challenged, 30 centimetres is the same length as 12 inches - but what did that additional format info indicate? It's not the first time we've seen it on the chart, but with little else to talk about this week, I thought it worth exploring below. There wasn't even a new number 1 this week in 1989, with "Kokomo" hanging on for a sixth week. In the runners-up slot, there was a changing of the guard, with "Teardrops" swapping spots with outgoing number 2 hit "Especially For You". "Teardrops" would be stuck there for four weeks. Last seen almost making the top 10 in early 1986 with "The Whole Of The Moon", the Scottish-Irish band went down a much folkier road for this lead single from the album of the same name. A Duran Duran single missing the top 50 used to be the exception to the rule, but it was about to become commonplace with this UK top 10 hit, which came with an MTV Award-winning music video, falling short. Wow, even this week's relevant breaker is a disappointment. And, it was a disappointment back in 1989 when it was the long-awaited comeback single for the complete line-up of CSNY. The quartet hadn't recorded a new studio album together since 1970's Deja Vu, but Neil Young had apparently promised to reunite if band-mate David Crosby ever kicked his drug addiction. More than a decade - and a jail term for David - later, and the American Dreams album was released to a pretty lacklustre reception. Personally, I would rather endure Bobby McFerrin than have to listen to "American Dreams" ever again. Australia's love affair with Melissa Etheridge continued, with her third top 50 hit in four months. Again, this track was much more successful in Australia than in the US, where "Like The Way I Do" didn't actually reach the Billboard Hot 100 until 1995. Melissa's music wasn't for me - and although she got off to a great start here, these back-to-back top 20 hits ("Like The Way I Do" and "Bring Me Some Water") were as good as it got for her on the ARIA chart. Here's the song that's listed with its 12" version receiving specific billing. 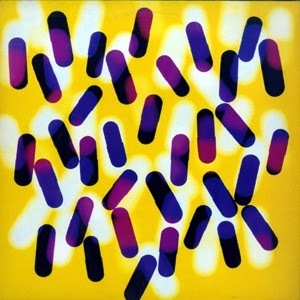 The lead single from New Order's Technique album, "Fine Time" fit in more with dance tracks like "Blue Monday" than poppier songs like "Bizarre Love Triangle" and "True Faith". It also tapped into the burgeoning acid house sound, which had yet to make much of an impression on the top 50 in Australia. So why is the 30cm format mentioned? Sometimes the appearance of (30cm) on the end of an entry indicated the song was only available as a 12" record (e.g. Man 2 Man Meet Man Parrish's "Male Stripper"). However, both 7" and CD single versions of "Fine Time" also existed. I've been trying to get to the bottom of this - speaking to both ARIA and AMR's David Kent - and all I can determine is that "Fine Time" made its debut thanks to sales of the 12" version, but that the following week, sales of the 7" kicked in. Perhaps there was a delay in the release of the 7"? As we'll see on next week's chart, the (30cm) was dropped and the catalogue number changed (how much of a trainspotter am I?) to the 7" number. We'd seen that happen before with tracks like Salt 'n' Pepa's "Push It" and Rick Astley's "Together Forever", where they start out with (30cm) listed and lose that detail over time. If anyone has any further light to shed on this, please leave a comment below! A second single lifted from live album Barnestorming, "Last Frontier" had started out as a track on Jimmy's most recent studio album, Freight Train Heart. That's all I have to say on the matter - if you like it, take a listen. If not, let's try to pretend this didn't happen. Next week: a much better selection of new entries from a variety of genres - hard rock, hip-hop, Scottish pop/rock and adult contemporary. And, some of them are even good songs! On discogs.com there is a 'test pressing' 7" of 'Fine Time' which has a 10-2-89 handwritten date on it (see http://www.discogs.com/viewimages?release=1293762)... so perhaps the 7" single was released later than the 12" in Oz? It would seem strange of them to run a test pressing after the commercial release. 'Orinoco Flow' at #12 from this week's chart was the first music video I ever recorded off TV. For some reason I was compelled to try getting a copy of this video so that I could view it as many times as I liked. I also recorded the top 5 from the Rage top 50 Countdown this week, during which they displayed coloured superscripts, as they sometimes did back then. I hadn't yet started to watch the full top 50 though. Maybe that's the reason - although I did look at the release dates on australian-charts.com, and both 7" and 12" were much earlier (unless they're listing UK dates). I'd have to re-check with a few singles I'm certain of the release dates for, but from what I recall when I last took notice of them on the australian-charts.com site, the 'release dates' (well, for singles released a long time ago anyway) listed there may actually be the date the single entered the UK charts... which of course isn't the actual release date. I've noticed a similar thing on wikipedia for some releases. From what I can gather, the release date listed on australian-charts.com would be the UK release date (it's 12 days [the Monday of the week] before it entered the UK singles chart, which makes sense). 'Fine Time' entered the AMR top 100 on 9th Jan 1989, so yes it was around for a few weeks before it cracked the top 50. So, maybe the 12" came out here first, charted for a few weeks in the top 100 and then the 7" came out in time for the song's second week on the top 50. Or, maybe the (30cm) indicates that the song was selling mostly as a 12" at first? Or, maybe the inclusion of (30cm) is a mistake - and, let's face it, it wouldn't be the first time there was one of those on the chart. I don't mind Jimmy's "The Last Frontier". He should have released it as the studio version/5th single off "Freight Train Heart" and then released his live recordings. January and early February is always the hangover from the previous year and not much happens on the charts. Funny, I always thought "Tucker's Daughter", "Teardrops" & "Especially For You" went to No.1 for at least a week each - damn you "Kokomo"! LoL. Tucker's Daughter and Teardrops went to number 1 on the AMR for one week each, but not on the ARIA chart, alas. I would have preferred both of them to Kokomo! I think 'Especially For You' was #1 for one week on the Take 40 Australia chart, which would have been the week before they switched to using ARIA's chart. Totally love Last Frontier! But i fully understand why people dont like Jimmy. I give Jimmy (and The Angels, and The Proclaimers) a hard time on this blog, but he's obviously been very popular and successful throughout his career! 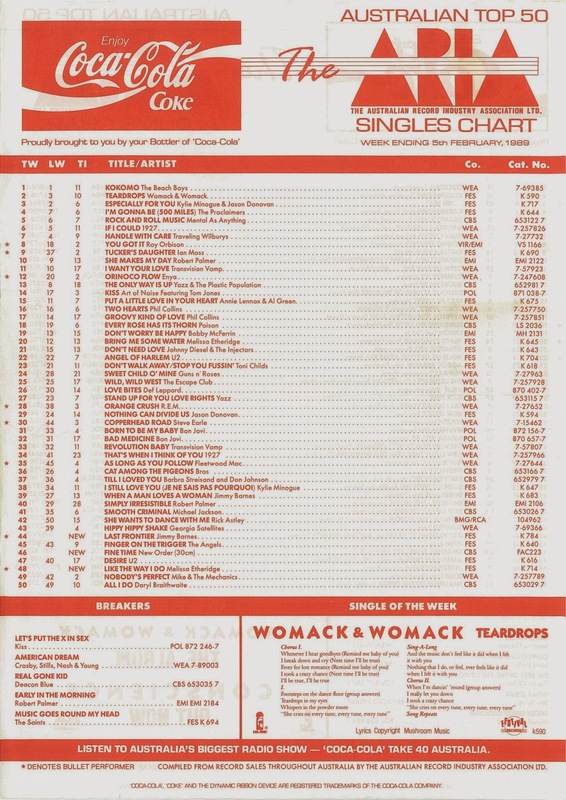 Looking at the 1987 charts you posted, initially Paul Lekakis "Boom Boom (Back To My Room" was (30cm) which, as I am trying to collect every song that reached the top 20, prompted me to buy the CD single in order to get the 12" version of the song on CD. Oh yes, I did find a CD single of that song: Remixed and released in Germany or Europe in 1992 but including the original mixes (7" and 12") on the CD. The (30cm) designation has also made me find Salt-N-Pepa "Push It" and Yello "Oh Yeah" (both 1988) but so far I have not found the correct version of Man 2 Man "Male Stripper" on CD, the 12" version of which is 8 minutes long but I am stuck with the 3 1/2 minute version from "87 Right On Track". At the start of 1991, the (30cm) was on C+C Music Factory's "Gonna Make You Sweat" at first until the chart changed from records to cassettes as the primary format. But if you look at the catalogue number, it is for the "Maxi Cassette Single" version. As for the Jimmy Barnes song, I'd like to skip it but it is the last song on side 1 of "Hits Of '89 Volume 1", the cassette of which was a Walkman staple for me from 1999-2004. Both that song and The Cockroaches "Permanently Single" both seem to be tacked-on to the end of each side like someone at EMI went "We need each song to run an extra few minutes". And speaking of tacked on, there was so much blank at the end of side 2 of that tape that my copy (which was second hand) had Michael Jackson "Smooth Criminal" and Phil Collins "Two Hearts" recorded on the end by the previous owner - much to my absolute delight when I found them! I really hate that JIVE BUNNY "That's What I Like" re-recording on the Spotify Top 100 list. It's crapola. I'm a JB purist! !